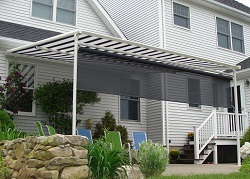 highly adaptable for unique installations where traditional awnings are not suitable. There are two styles available. 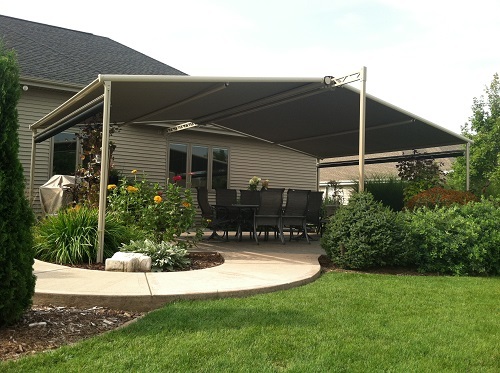 The Pinnacle Two is a cassette style motorized awning with integrated "constant tension" technology. This model is perfect for mounting onto an existing structure, such a pergola or over a skylight. 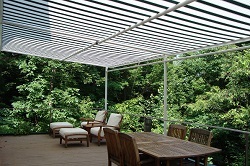 This retractable awning is engineered for sun only, and can be mounted completely flat with zero pitch. For applications where rain control is necessary, the Gennius is best suited. The Pinnacle One is identical to the Pinnacle Two, but with added front support posts. This model is ideal for large decks or patios constantly bombarded by wind. The front support posts allow this retractable awning to project up to 16' out, but is significantly more resistant to the wind than a lateral arm retractable awning. The small mounting profile allows the cassette-style fabric housing to fit into tighter spaces. 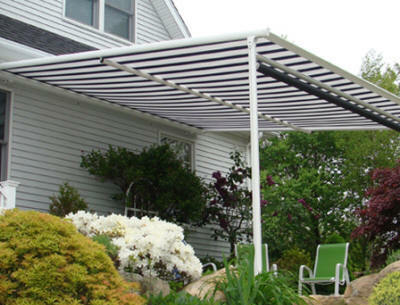 An optional front drop valance can be installed between the front posts to create an entire day's worth of shade! 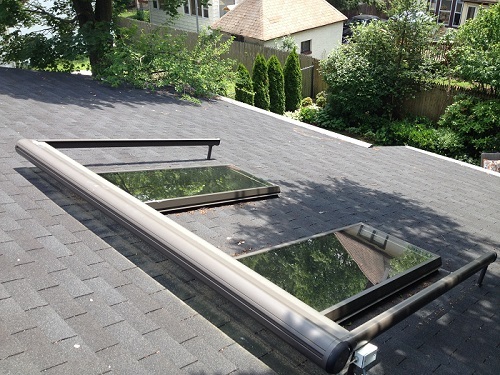 The Pinnacle is a motorized exterior retractable screen for shading skylights, pergolas and glass roofs. The Pinnacle features a housing that incorporates a brush to reduce debris from rolling up with the fabric. Powder coated aluminum components are corrosion resistant. A tension driven rope and pulley system keeps the fabric taut regardless of projection. Cassette-style hood protects the fabric when retracted. The living room under this big skylight frequently becomes unbearably hot and bright, even in the winter. 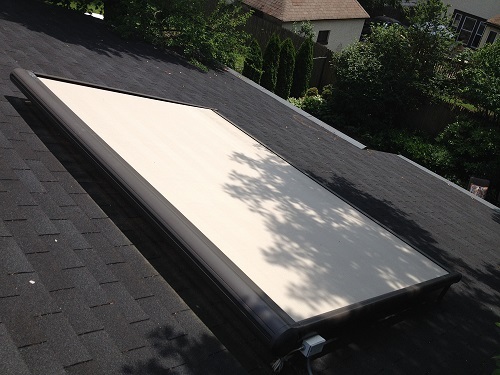 This Pinnacle Two was installed onto the roof to help regulate the interior temperature. 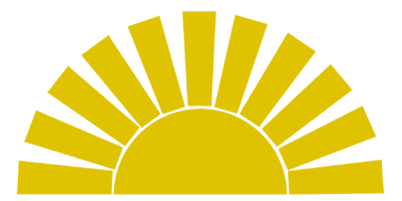 There is a noticeable improvement to the summer cooling costs when the awning blocks the sun during peak hours. After a homeowner in Edgewater realized their pergola did not provide the shade they were expecting from it, this Pinnacle Two was easily retrofitted on top of it. 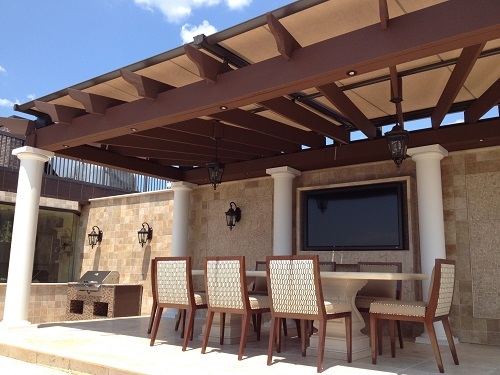 With less than optimal mounting at this home's wall, the Pinnacle was made into a large freestanding retractable pergola.